Pawel Pawlikowski, the celebrated Polish filmmaker behind critically acclaimed films like Last Resort, My Summer of Love and The Woman in the Fifth, now follows up his previous movie, the Oscar-winning Ida, with another film that he clearly holds dear to his heart. This is shown by a dedication at the very end that simply says “For My Parents”, a gesture that clearly means a lot to him, as does the movie Cold War which he has very loosely based on the relationship between his mother and father, who also shared a turbulent coupling similar to what he portrays here. Pawlikowski had a clear goal in mind with this film, which was not just to pay filmic homage to the two people without whom he would not be the person that he became, but to also make a sweeping mini-epic of a European romance, similar to something you would find in the library of auteurs like Ingmar Bergman, but doing it in a rather unique way that manages to focus more on the intimacy and immediacy of the situation at present. In other words, it’s very different to the big romantic epics of the past but is just as ambitious and passionate. The film begins in Poland 1949, when a group of intellectual musicians, including Wiktor (Tomasz Kot), are scouting around for a troupe of musically-gifted peasants to form a chorus intended to perform traditional folk songs and dances. It’s part of an effort by the newly-founded Communist regime to connect with the rural population, but they also use it as a propaganda device to pay tribute to Joseph Stalin and the Soviet influence that’s quickly engulfing most of Europe. During the rehearsal process, Wiktor finds himself drawn to peasant singer and dancer Zula (Joanna Kulig), whose feelings towards him are mutual, and soon the pair hit it off, igniting a whirlwind romance that spans over the course of fifteen years, across several other European countries including Paris, Berlin and Yugoslavia, and which sees the two be continuously drawn together by their love for each other, but also torn apart by the increasingly complicated world that they live in. Normally, this would be the kind of plot you would find in a grand, sweeping Hollywood epic that filmmakers like David Lean or Cecil B. DeMille might have made back in the day, that of a pair of impossible lovers who come together amidst a restrictive and historical political regime, and would have cast strappingly handsome – and most importantly English-speaking – actors in the lead roles in heavily romanticised and Cinemascope-shot scenes that would have stretched things out to a minimum of three hours. That is not at all the case with Pawlikowski’s movie, as he swiftly rewrites that rulebook by sticking to Polish-native actors for the two lead parts, framing it in that famous boxed-off Academy aspect ratio, shooting it in black-and-white, nixing a big orchestral score in favour of a collection of various music from traditional folk music to smooth jazz to popular radio hits of the time, and ensuring that it doesn’t even reach the hour-and-a-half mark with an 85-minute running time. By doing all of that, he’s made a much more intimate romantic mini-epic that tightly focuses on the lives of these two people without overstepping its boundaries, and doesn’t have nervous financiers to tell him to make the film more audience-friendly or remove its roots in European cinema; he’s admirably managed to make a very personal film where’s he’s firmly in control, where he can tell the story he wants to tell and take it in the direction that he wants to take it in, even if it leads to somewhere that most audiences won’t necessarily agree with. Much like his previous film Ida, it’s an exceptionally made piece of work with some luscious and smooth black-and-white cinematography that ironically brings out the colour in nearly everything captured in frame, including two central performances by a stern and brooding Tomasz Kot and a very lively and spirited Joanna Kulig that say everything you need to hear without much dialogue. The editing is smooth as can be, although you can tell that there must have been quite a lot of footage on the cutting room floor, as their romance and frequent meetings over time do just sort of happen, and you get the feeling that those deleted scenes may have provided a bit more context to their eventual coupling. However, whilst that would be a cause for concern in any other situation, here it kind of works in the film’s favour; the movie feels like a collection of snapshots of this couple’s relationship over the course of time, with each scene being shown acting as a random vignette of their biggest hurdles together, which is something that the editing manages to capture without making it too obvious that a lot was cut out for time. Even if it wasn’t so successful, Pawlikowski is a talented enough filmmaker that he can make the film work without the tons of extra unused footage, and he is still able to passionately tell the story he wants to tell with what he is left with. The romance itself is revitalising to watch, thanks once again to the breathtaking lead performances of both Kot and Kulig who really sell their respective characters’ feelings of frustration, empathy, or in Kulig’s case crippling self-doubt as she later embarks on a dissatisfying singing career. Comparisons will inevitably be made to Romeo and Juliet, in that it’s about a pair of star-crossed lovers brought together and torn apart by the cruel nature of the world they live in (and without getting into spoiler territory, there’s a lot of other reasons why that particular comparison could be made), but Pawlikowski isn’t setting out to pay homage to Shakespeare here; instead, he’s made a film that is so desperately personal that only he could accurately bring it to life in his own unique way, a trick he has just about managed to pull off. 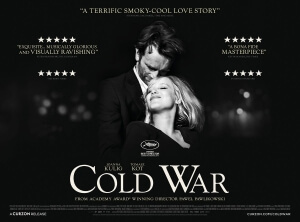 Cold War is a stunning romantic mini-epic that foregoes most of the classic historical epic tropes and just does its own thing, with director Pawel Pawlikowski firmly in control of this deeply personal and passionate movie that’s beautifully made and wonderfully acted.